Script mode supporting complex test environments by creating SIP sequences for irregular tests, etc. 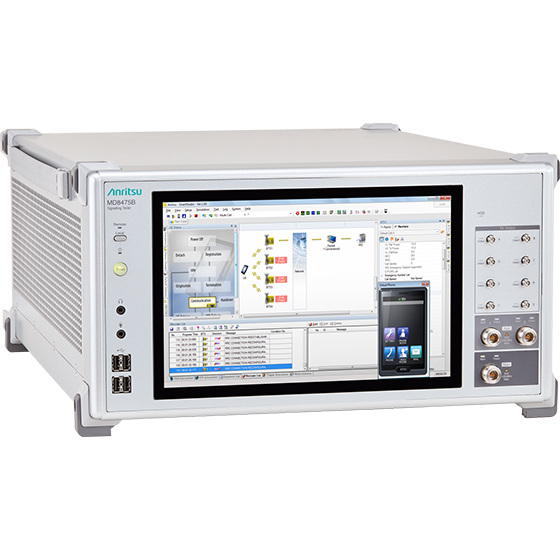 The Signalling Tester MD8475B is an all-in-one base station simulator supporting LTE, LTE-Advanced, W-CDMA/HSPA/HSPA Evolution/DC-HSDPA, GSM/GPRS/EGPRS, CDMA2000 1X/1xEV-DO Rev. A. and TD-SCDMA/TD-HSPA. It supports service, VoLTE and call-processing tests for multimode LTE smartphones and mobiles with excellent cost-performance. In addition, 1-Gbps IP performance evaluation tests are made easy by the built-in traffic generator with all-in-one support for LTE-Advanced 3CA/4CA technologies. 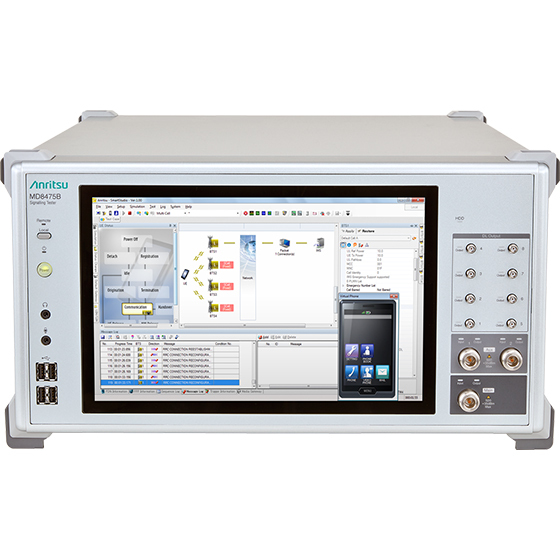 Using the GUI-based SmartStudio MX847570B software with the MD8475B base-station simulator makes it easy to configure a smartphone test environment. Various parameters, such as frequency changes, control status, etc., are set at the GUI to run one-touch tests—including quasi-normal tests—that cannot be run easily on live networks. Eliminating the need to create test cases or understand signalling protocols makes it easier to focus on testing smartphone functions and performance. A full line of test environments are supported for the general mobile verification phase, such as max. throughput performance tests, stress tests, and battery consumption tests of LTE terminals, as well as CS Fallback, call connection reliability and stability tests at handover, communication tests at low RF power, offloading from LTE to WLAN tests, and service verification using LTE multiple PDN and SMS in a multi-cell environment*. In addition, the time required to configure a test environment is greatly reduced by the easy-to-use GUI-based SmartStudio software, as well as supplied test sequences for automatic remote control of the GUI. Verifies correct mobile handover by changing settings between neighboring base stations. Simulates various usage environments for measuring battery life. Simulates emergency notifications, such as earthquake early warning, which are hard to test on live networks. 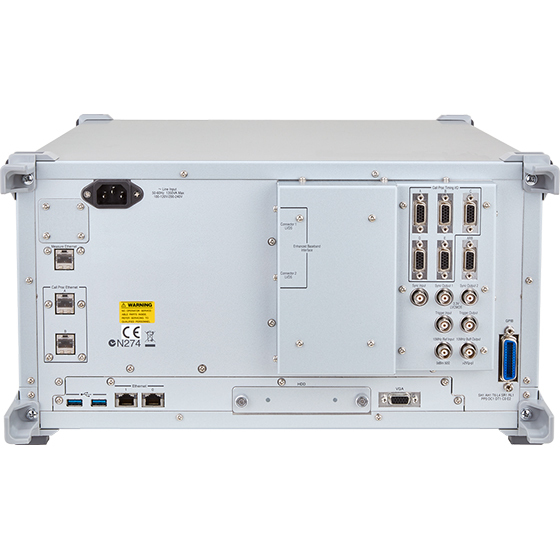 Evaluates throughput by changing base station settings and simulates built-in SIP server. Tests both basic mobile calls and Voice over LTE (VoLTE) calls. Simulates a policy server and dedicated gateway for distributing traffic over a WLAN. The SmartStudio Manager MX847503A software is for editing test sequences and running created test sequences automatically and continuously. This software automates manual testing using the SmartStudio MX847570B software. Automated, operator-free evaluation improves efficiency. Additionally, Pass/Fail evaluations can be reported along with the continuous test results. 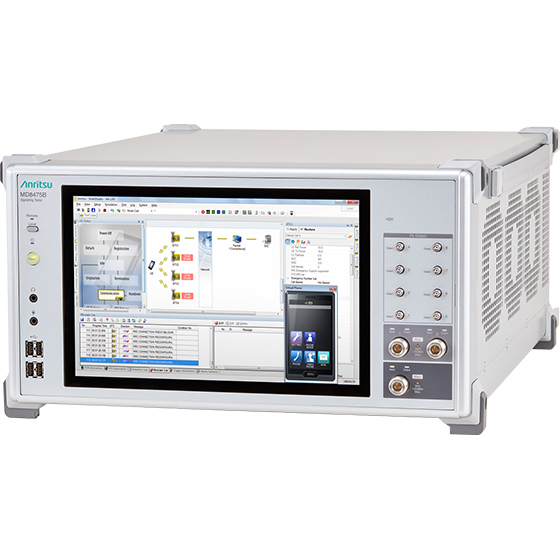 In particular, the MD8475B supports fully automated tests for all networks even when testing a 20-band LTE terminal using Primary Cell band types and Secondary Cell 1/2 band types requires a total of 8000 band combinations for 3CA tests. *: Some options may be required depending on the system configuration. The eCall Tester MX703330E software runs with the MD8475B to simulate the eCall service PSAP. The software emulates eCall communications (MSD communication to Voice call) between the IVS and the PSAP at a traffic accident. The communications sequence between the IVS and PSAP is tested. The status of communications between the IVS and PSAP is displayed. The eCall execution result is displayed on-screen and saved to a file. The set expected reference MSD data is compared with the received MSD data and the results are displayed. The presentation focus on Anritsu automation software SmartStudio Manager which creates the environment for full scale automation setup in mobile network simulation.